Bowls for Haiti is a fundraiser for Partners in Health / Zanmi Lasante, a medical organization working in Haiti since 1987. 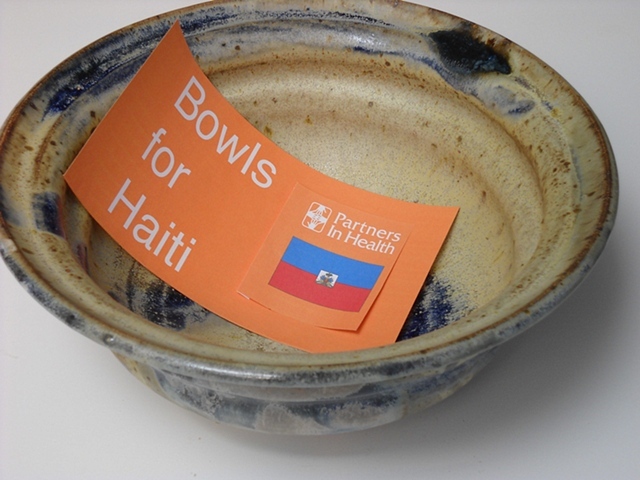 Bowls for Haiti is also a partnership with the potters of New Mexico; their generous donations will help Partners in Health continue their work in Haiti under increasingly difficult post-earthquake conditions. The potter's bowl is a beautiful, personal object, a symbol of life and the work of the hand. It is a symbol of feast as well as famine. Bowls for Haiti will offer hundreds of different kinds of bowls, many sizes, shapes and colors; as varied as the potters who make them. Each $20 donation to Partners in Health entitles the donor to a free, one-of-a-kind bowl. Bowls for Haiti will be at Albuquerque's Harwood Art Center on June 5, 1-5 pm. It is free and open to the public. Call 505 873.0609 or 410.0271 for more info We can accept check or cash donations only; no credit cards. Click on 'Information' to find out more about PIH. Look at the links page for more about Haiti and our generous sponsors.